Contributors Fundamental Analysis Euro Area PMIs: Too Early for a Substantial Rebound? The Eurozone’s preliminary PMIs for April are due on Thursday at 08:00 GMT and forecasts point to a rebound, albeit only a modest one. Make no mistake, these are the most important figures for the euro right now, and any substantial surprise will likely dictate the currency’s near-term direction. Alas, a major upside surprise seems somewhat unlikely for now. 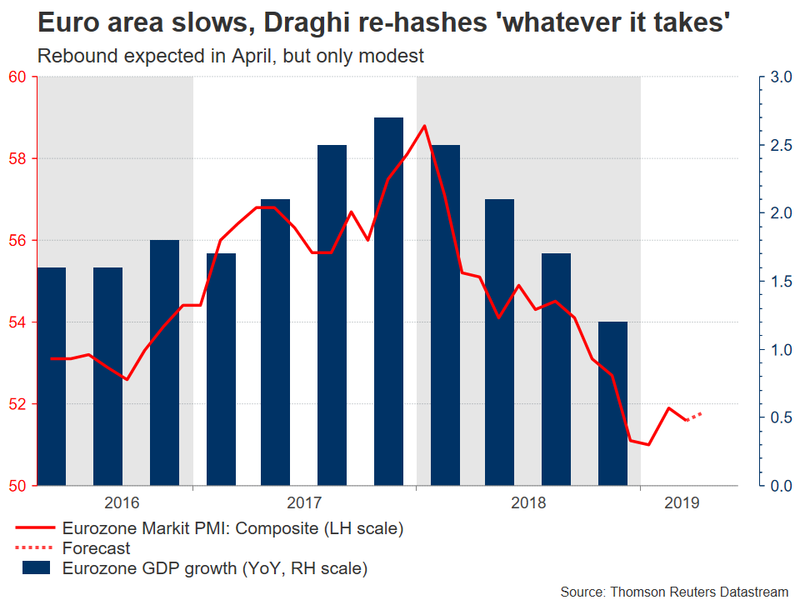 After a long period of being largely ignored by the market, the Eurozone’s PMIs have returned with a vengeance in recent quarters, repeatedly triggering major reactions in the euro as traders started to focus on the growth outlook once again. 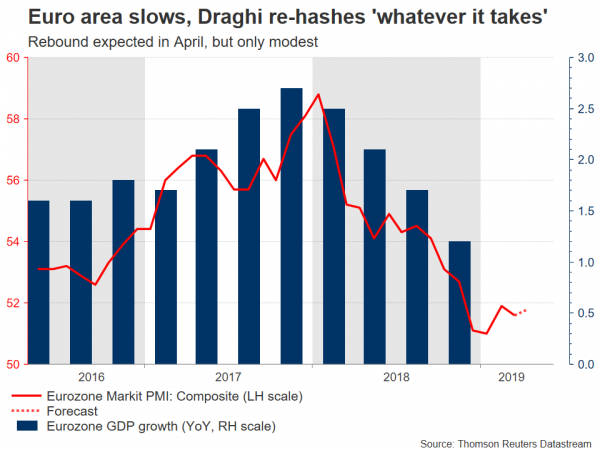 The euro area economy has slowed drastically, and since the PMIs are released ahead of the ‘official’ data and are a reliable growth indicator, investors pay very close attention nowadays. Not least because the European Central Bank (ECB) seems prepared to add even more stimulus if the economy deteriorates any further. At the latest policy meeting last week, ECB President Mario Draghi repeatedly emphasized that the central bank stands ready to “use all instruments” to support the economy, echoing his famous ‘whatever it takes’ speech from 2012. Yet, the bloc’s PMIs are expected to show some improvement in April. The manufacturing print is forecast to rise to 47.9, still below the 50 mark separating expansion from contraction, but notably better than the 47.5 in March. However, the services index is seen ticking down to 53.2 in April from 53.3 previously – perhaps in a signal that the manufacturing malaise has started to ‘infect’ the otherwise healthy service sector. As such, the composite figure that blends these two measures is projected to climb to 51.8, from 51.6 earlier. Factors arguing for a positive surprise in the PMIs include the bigger-than-expected rise in the forward-looking component of the German ZEW survey for April, which highlighted that pessimism among investors is abating thanks to progress in the US-China trade talks and Brexit risks receding. Arguing in the opposite direction are recent headlines that the US could slap tariffs on a list of EU products soon. While no decision will be made until the summer, the risk of an EU-US trade standoff is mounting. Separately, as Markit’s chief business economist noted in the March survey: “forward-looking indicators from the manufacturing sector suggest goods production will fall further in the coming months”. He was referring to a plunge in new orders, which implies that even if we do see a rebound in overall activity in April, it’s likely to be only modest – limiting the prospect of a major upside surprise. The French and German PMIs will be released ahead of the euro area-wide data, at 07:00 GMT and 07:30 GMT respectively, and any market reaction could begin with them. Technically, advances in euro/dollar may encounter immediate resistance near 1.1325, the April 12 high, with a bullish break opening the way for 1.1450. On the downside, declines could stall around 1.1250, an area marked by the inside swings high in early April. A downside violation would turn the focus to the 1.1180 zone.